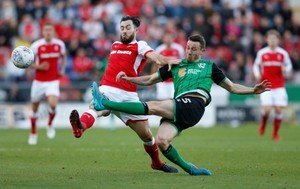 Rotherham United Manager Paul Warne has said today in an interview on iFOLLOW that he tried to get Richie Towell back the day after the Wembley Play-Off Final which the midfielder played a big part in. As we know Richie has now signed for Rotherham on a season long from Brighton and Hove Albion after, it seems, a lot of talking between the two clubs. Warney also said it was never on the cards that he was signing for Barnsley despite it being on social media – although, to be honest, after what has happened in the past with Millers players or players who are supposed to be on their way to becoming Millers ending up at Oakwell, it wouldn’t have surprised any of us if that had actually been true. I, like some other fans, was pleased to see Richie on the bench for Rotherham at Wigan but hoped he might have come on for half-an-hour or so. And it was nothing to do with the fact that he wasn’t fit as both him and Warney have said he is. In training he’s also been wearing the number thirteen so we will have to wait and see if he’s going to keep that number. Last season he wore number seventeen but that had already been allocated to Ryan Manning who arrived on loan from Queens Park Rangers. It is good to have Richie back and I’m sure he’ll fit into the team – whether he will be picked ahead of others, well that’s up to the Manager.